The mini “combo” shaker is a small, portable 20 N (4.5 lbf) permanent magnet shaker with an integral power amplifier. The design eliminates the need for a separate, inconvenient power amplifier and attendant cables. The drive signal from most vibration controllers and signal generators can be directly connected to the BNC connector on the body of the shaker. The mini “combo” shaker is ideally suited for frequent conveyance, and educational and research purposes in lab and industrial environments and is available in vertical only and mono-base slip table configurations. Sentek Dynamics is the first to offer a compact simultaneous 3-axis shaker. Based on the mini “combo” shaker design with an integrated amplifier, the mini simultaneous 3-axis shaker provides 20 N 94.5 lbf) in each axis to simulate a real-world environment for testing small electromechanical and electronic components, medical devices and as well as educational purposes. Note: Sentek Dynamics’ mini simultaneous 3-axis shaker uses the Crystal Instruments’ Spider System vibration controller for advanced Multiple-Input Multiple-Output (MIMO) Control. The Spider System recreates multiple degree-of-freedom vibration environments in the testing laboratory and provides all the control types you may require including MIMO Random, MIMO Sine, MIMO TWR, and more. For more information on the Spider System see the Vibration Controllers section or contact the Sentek Dynamics’ sales office. 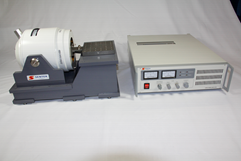 The VT Series desktop shakers are designed for vibration testing of small components and assemblies and are available in forces ranging from 50 N (11.2 lbf) to 1000 N (225 lbf) when paired with the recommended LA Series amplifier (see tables below). The VT Series shakers incorporate a robust, lightweight armature and suspension system that provides superior payload support, and lateral and rotational restraint. To facilitate testing in more than one axis, optional mono-base slip tables are available. Additional options include head expanders to accommodate larger test articles and a blower for enhanced cooling to enable peak shaker performance during extended periods of operation. The MS Series are designed for laboratory experiments, modal studies and structural analysis. These shakers are available in forces ranging from 50 N (11.2 lbf) to 1000 N (225 lbf), featuring proven performance in a wide range of modal analysis applications. Whether the device under test is a PCB card, automotive component, power machinery, passenger car, airplane, or space craft, one of the MS series modal shakers is capable of performing the necessary tests. To carry out a successful experimental modal analysis procedure, the choice of excitation function and system is crucial. The modal shaker needs to be portable, durable, and easy to set up. The MS series Modal Shakers are ideal for performing modal analysis. The MS Series modal shakers are best suited for creating an appropriate input forcing function through usage of the Crystal Instruments’ EDM Modal software. Modal Testing and Analysis whitepapers available for download.